CWNA PW0-105 | CCIE or Null! Well, I finally got around to taking a shot at the CWNA exam and ended up with some successful results! It feels like an eternity but over 2 years ago I took a stab at CWNP’s CWTS exam. If you remember from my assessment of the CWTS exam itself I was able to knock it out fairly easy with a passing score in the 90’s with an ending statement that I should have just skipped the CWTS and went straight for the CWNA. Well after passing the CWNA with a score again in the mid-90’s I still stand by that statement. However I’m sure the additional 2 years of experience since then provided me with a considerable handicap. In regards to my study preparation for the CWNA, just like I did for the CWTS I used official CWNP CWNA Study Guide from Sybex, that and the 6 years of wireless experience I have. 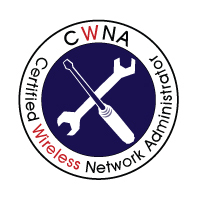 Just like the CWTS exam I found the CWNA to be very straight forward it did have a lot of good questions that made me do a bit thinking and the questions were much more detailed then what I remember dealing with on the CWTS exam. This time however a quick read the through the CWNA study guide was pretty much all I did. I did utilize one or two of the question pools that are available for purchase on CWNP’s website and the questions are great for exam preparation if there is anything I commend CWNP for it is for providing great study material for thier exams. Now, I still consider the CWNA should be basic knowledge for any network administrator/engineer that has to work with an extensive WLAN. After all everyone knows wireless is a bit more complicated then just deploy access point and hope for the best, having an understanding of the 802.11 technologies is detrimental to a successful WLAN deployment in my own opinion. Now while CWNA doesn’t cover all the 802.11 protocols in great detail I think it is a great entry point at understanding the technologies from a high level. Now, i just hope the CWNP certification gain a bit more traction in the job and because just as well as the CCNA/CCNP certification.